On a raised platform, two sphinxes are sitting on either side of a grand doorway, guarding the entrance of an ancient temple. They are known to the worshippers and the priests as the divine beings that ward off evil and remove sins. A mysterious smile adorns their human faces, which are surrounded by full lion’s mane. One is male, the other is female, and as a faithful couple they have been seated in this way side by side for many centuries. According to this temple’s tradition, they dissolve the negative vibrations of all who look at them as they enter the temple. Have we just entered an ancient Egyptian temple, or walked through the gate of a Greek shrine from long ago? No, we are in India. Visiting the famous temple in Chidambaram where Shiva Nataraja dances his cosmic dance for all eternity. Beings that are partly animal and partly human are well known from the mythologies of all ancient civilizations. Greek mythology speaks of sirens, beings that are half bird, and centaurs that are half horse. In Indian mythology we are acquainted with kinnaras and kimpurushas, who are similarly described as composite beings. One such mysterious and ancient being still fascinates modern humanity almost as much as it did in ancient times. This is the sphinx, a creature having the body of a lion and a human face or head. It was known as the embodiment of sacred and secret knowledge. And in antiquity it was often placed at the entrances of temples and cities because it was regarded as being able to ward off evil. The most famous of all sphinxes is the Great Sphinx of Gizeh in Egypt that guards the pyramids. Sphinxes were until now not thought of as being part of the Indian civilization, but I write this article to share my discovery of sphinxes guarding the sacred precincts of many temples all over India. In South India they are called purushamrigas or human-beasts. Elsewhere they are also known by other names. As early as 1986, I realized the resemblance between the mythological beings called purushamrigas, who guard the entrance of the Nataraja temple in Chidambaram, and the sphinxes known from ancient Egypt, Greece or the Near East. Later I found many more depictions of purushamrigas, first in the Nataraja temple of Chidambaram. Later on, I searched for them in other temples as well. Visiting about 50 temples so far, I have identified over a hundred depictions in stone and wood of these composite beings. 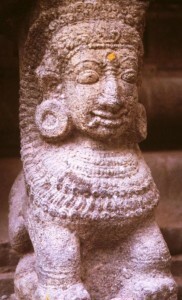 Such sculptures are always found in ritually significant places in the sculptural program of the temples, near the entrances of shrines, or among the decorations of the gopuram or temple gateway, in correspondence to the role of the sphinx of antiquity as a divine being that guards entrances and wards off evil. Not in every temple does the living tradition remember the role and function of the purushamriga. Besides Chidambaram, I have found a similar tradition in Kalahasti, Andhra Pradesh, where Shiva is worshipped in the form of the element, Air. In this temple, the devotees touch the purushamriga, which guards the temple entrance, to be rid of the impurities of worldly life. Another living tradition regarding the purushamriga is found in a village near Madurai. Thispurushamriga is placed on top of two stone pillars which function as a water meter in an artificial lake. At the beginning of the monsoon, the people of the village gather and accompanied with processional music proceed to the lake. There they burn a hundred coconuts, the ashes of which are ritually applied on the purushamriga. This ritual, so believe the people of this area, will bring abundant rain and fill the lake. Not only do we find numerous depictions of sphinxes or purushamrigas in the sculptural plan of many temples. In South India I have established that they also play an important role in temple ritual, as part of a bronze lamp, and as the vehicle of the deity in temple festivals. Its role in the ritual is connected with the Yajur Veda. In this sacred text, a purushamriga is described as playing a role in the ashvamedha, a Vedic fire sacrifice. This verse from the Yajur Veda describes the purushamriga as a being dedicated to the Moon. In all Shaiva temples of South India this verse is chanted at least once in a day, as the mantra of the purushamriga dipa, the ritual lamp depicting the sphinx. Temples dedicated to Lord Shiva, his consort, and his sons, all follow doctrines that include the performance of the 16upacaras or offers as part of the daily rituals. One of these upacaras is the offering of lamps, and is called the Diparadhana ceremony. This ceremony has to be performed at least once during the daily cycle of rituals. Although a variation in the number and types of lamps is found among the Shiva temples, the lamp that depicts the purushamriga is, according to the doctrine, a permanent and essential element of the ritual. Invariably the purushamrigas depicted on these bronze lamps are standing in worship, their hands folded in the Anjali mudra, the hand gesture of adoration. A prabha or arch surrounds them, on which five wicks are fixed, which are dipped in ghee and lighted at the moment of worship. The priest, standing in front of the deity inside the sanctum, lifts the purushamrigadipa up towards the deity, and moves the lamp tracing three times the sign of the sacred syllable Om. Simultaneously, he chants the verse from the Yajur Veda. Indian sphinxes or purushamrigas have peculiar features that set them apart from sphinxes found in other parts of the world. Sometimes, as in Chidambaram, they come in pairs. Many of them have fangs protruding from their mouths. And they sometimes wear jewelry. They almost always have elongated earlobes, decorated with ornamental disks. Sometimes they are depicted seated, sometimes as striding, and even occasionally as jumping. The purushamrigathat guards the entrance of the temple in Kalahasti is one of those. These appear to represent the earliest periods of sculpture in southern India. Among later sculpture, they are sometimes depicted as rishis or seers in which case they have fully human upper bodies. The vahanas or vehicles that take part in the processions are all of this type. They wear their matted hair knotted on top of their head, and they have long beards and moustaches. These rishi purushamrigas are often shown worshipping the Shiva Linga with a lamp and bell. During later medieval periods such purushamrigas are sometimes sculpted in pillared halls of the great temples where they reach human size. Depicted at times as vigorous warriors brandishing a weapon. Or also welcoming the visitor with folded hands as in the great temple in Tanjore. The mandapa or pillared hall, which fronts the Subrahmanya temple, haspurushamrigas sculpted as part of the pillars flanking its front entrance. Here thepurushamrigas have the lower body of a lion, with pronounced claws and powerful hips. They wear their hair knotted on top of their heads and wear elaborated jewelry. They have the beards and moustaches typical of the style of the Nayaka dynasty, the period to which this mandapabelongs. Some of the sculptural representations of purushamrigas found in temples are narratives depicting legends that involve this mythological composite being as one of the acting characters. When the Pancha Pandavas, the five brothers who are the heroes of the Mahabharata, ruled Indraprastha, they wished to perform the Rajasuya Yajna for the prosperity of their kingdom. For a complete and successful performance of such a great ritual, it was a tradition to invite all kings. Therefore, each four of the brothers set off in one of the cardinal directions. Bhima went to the North until he arrived at Kubera’s garden. Kubera is the guardian deity of the North, as well as the god of Wealth. In Kubera’s garden he met the divine being, the purushamriga, or human-beast, the creature that has the body of a lion and the head of a human being. Bhima requested the purushamriga to attend the Rajasuya Yajna, and to function as the guardian deity. The purushamriga agreed to attend, but he challenged Bhima. As a staunch devotee of Lord Shiva he insisted his Shiva dhyanam (meditation) should not be disturbed. Therefore, Bhima must run before him, and never halt or disturb his progress in any other way. If he caught Bhima before reaching Indraprastha, the purushamriga would eat him. With the encouragement and blessing of Lord Krishna, Bhima accepted the conditions. Although Bhima was a great athlete, the purushamriga quickly began to overtake him. Bhima had received magical stones from Lord Krishna. When Bhima threw the stones across his shoulder, they turned into stone temples with thirthas or ponds. Before continuing to chase Bhima, the purushamriga would first take a bath and perform his puja or worship for Lord Shiva. One by one Bhima threw the magical stones across his shoulder, thus delaying thepurushamriga. Bhima was about to reach Indraprastha, just as he threw the last stone. But as he had crossed into his own kingdom with only half of his body, the purushamriga caught one of his feet. Now Dharma, the elder brother, who was known for his sense of justice, was asked to make the judgement in this situation. He judged the purushamriga had the right to eat half of Bhima’s body. When the purushamriga heard Dharma’s decision, he explained he was satisfied with Dharma’s justice. Therefore he would not eat Bhima. When the Rajasuya Yajna was completed, the purushamriga asked Dharma, “My task is over, where should I go now?” Dharma’s reply was that the purushamriga should go to Tillai-Chidambaram. That was the heart-chakra of the world, and Lord Shiva would arrive there in the future to perform his cosmic dance. The purushamriga would guard the entrance of the temple, and remove the impurities from all those who entered the temple to experience the Lord’s cosmic dance. This discovery of the presence of the sphinx in Indian art and tradition contributes to the Indian heritage. The aim of this article is to shine a fresh light on India’s history, and its place among the great civilizations of ancient and modern times. For a somewhat broader introduction into the subject of the sphinx in Indian art and culture, I invite the readers to visit my web site at www.vedic-culture.com. Here I have also posted some illustrations of purushamrigas from the Nataraja temple in Chidambaram, as well as from other temples.